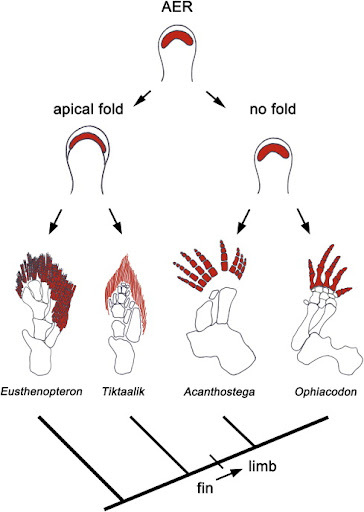 Half a century ago, the apical ectodermal ridge (AER) at the distal tip of the tetrapod limb bud was shown to produce signals necessary for development along the proximal–distal (P–D) axis, but how these signals influence limb patterning is still much debated. Fibroblast growth factor (FGF) gene family members are key AER-derived signals, with Fgf4, Fgf8, Fgf9 and Fgf17 expressed specifically in the mouse AER. 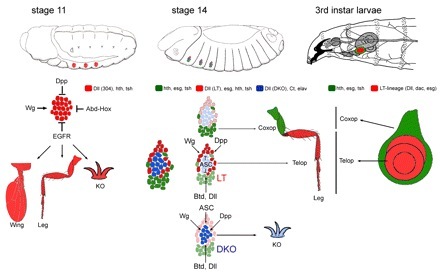 Here we demonstrate that mouse limbs lacking Fgf4, Fgf9 and Fgf17 have normal skeletal pattern, indicating that Fgf8 is sufficient among AER-FGFs to sustain normal limb formation. Inactivation of Fgf8 alone causes a mild skeletal phenotype; however, when we also removed different combinations of the other AER-FGF genes, we obtained unexpected skeletal phenotypes of increasing severity, reflecting the contribution that each FGF can make to the total AER-FGF signal. Analysis of the compound mutant limb buds revealed that, in addition to sustaining cell survival, AER-FGFs regulate P–D-patterning gene expression during early limb bud development, providing genetic evidence that AER-FGFs function to specify a distal domain and challenging the long-standing hypothesis that AER-FGF signalling is permissive rather than instructive for limb patterning. We discuss how a two-signal model for P–D patterning can be integrated with the concept of early specification to explain the genetic data presented here. Molecular Evolution: Mice Given Bat-like Forelimbs Through Gene Switch A research team led by Dr. Richard Behringer at MD Anderson Cancer Center reports that they have successfully switched the mouse Prx1 gene regulatory element with the Prx1 gene regulatory region from a bat — and although these two species are separated by millions of years of evolution — the resulting transgenic mice displayed abnormally long forelimbs.